As Hurricane Irma approaches South Florida, the U-Surge Project has launched a storm surge webpage for Miami. 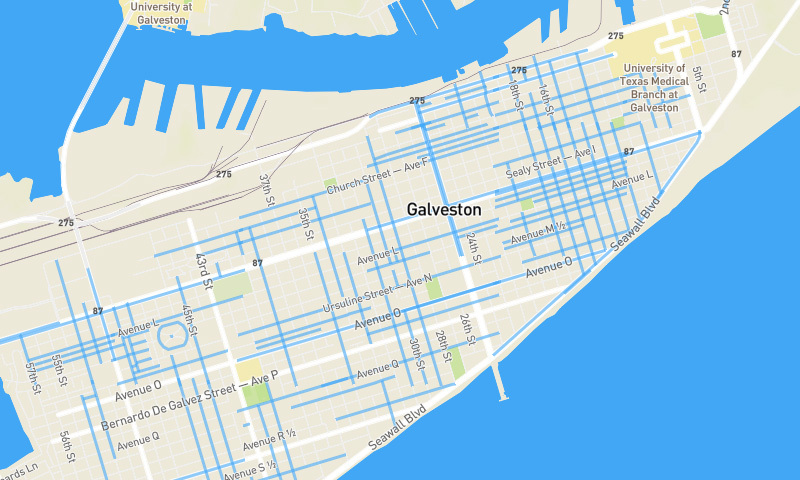 This page is open to the public and provides insights on both local storm surge history and long-term coastal flood risk, pulling data from 27 hurricanes and tropical storms over the past 137 years. The website provides infographics, historic maps, information on extreme water level risk and a multimedia archive. The Great Miami Hurricane of 1926 generated a 15-ft storm tide (storm surge + tide) in southern Miami. 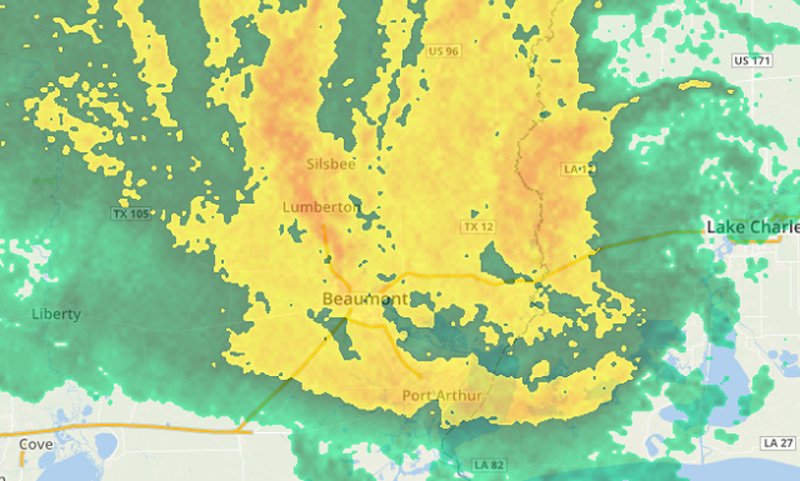 The U-Surge Project provides a multi-media archive of storm surge events in this area. 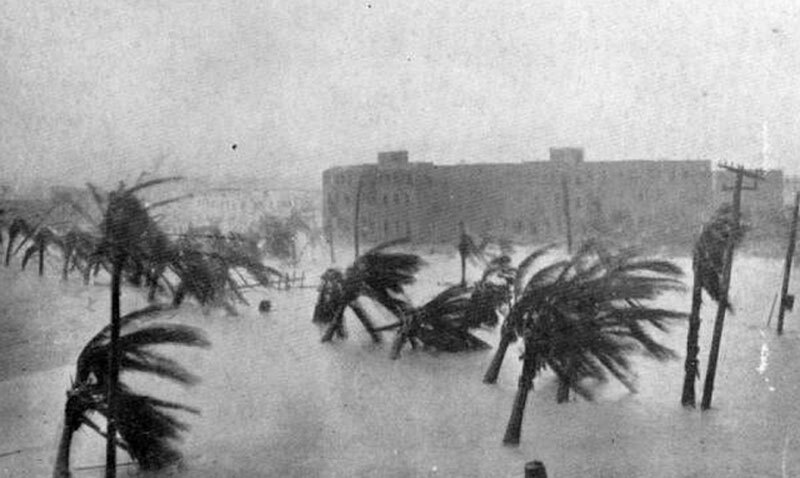 The picture above, taken from the multimedia archive, shows what a 15-foot storm tide looked like during the Great Miami Hurricane of 1926. This picture is one of the all-time great storm surge education and awareness photos because it shows that storm surge truly is a "dome of water" that pushes inland. Note how only the tops of the palm trees emerge from the saltwater. 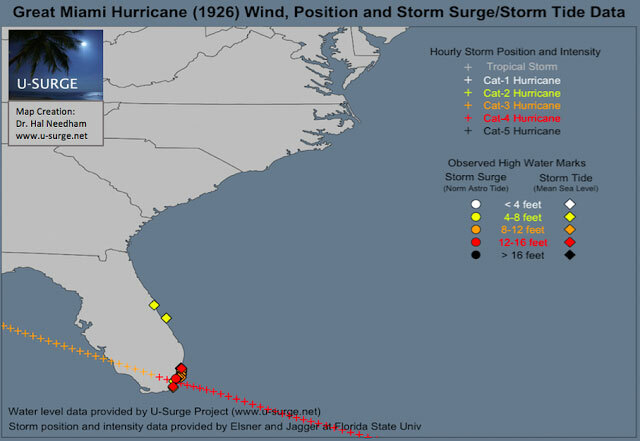 The Great Miami Hurricane of 1926 produced the highest storm tide (storm surge plus tide), reaching 15 feet. Since 1880, three hurricanes have generated storm tide levels of at least 11.5 feet. The last to do so was Hurricane Andrew in 1992. Irma's storm tide has the potential to keep company with the three highest storm tides in recorded history for the region. 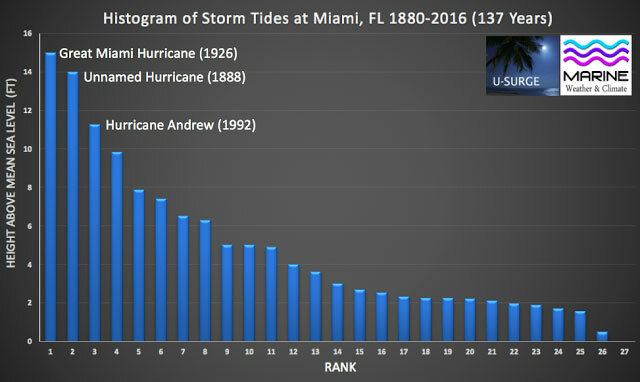 If Irma's storm tide exceeds Andrew's, it would be the highest storm tide level in Miami in 91 years. Based on a log-linear regression plot of data since 1880, the 100-year storm tide level in Miami is 14.61 feet. That makes the 15-foot storm tide in 1926 a 108-year event. Since 1880, three hurricanes have generated storm tide levels greater than 11.5ft (3.51m) in Miami. The U-Surge Project will regularly update our time series plots as Irma approaches Miami, enabling us to put this storm surge event in climatological context. At this point, the potential exists for a substantial storm surge near Miami, but slight shifts in Irma's track will produce large changes in storm surge levels. The offshore bathymetry (water depth) east of Miami is relatively deep, which means that strong hurricanes tracking just offshore are not able to generate large surges. Consider Hurricane Matthew, which tracked just offshore last year but generated a storm surge of only around 1 foot near Miami. For hurricanes to generate large storm surges near Miami, the hurricane's eyewall needs to make a close approach to the city, and generally track over Biscayne Bay. 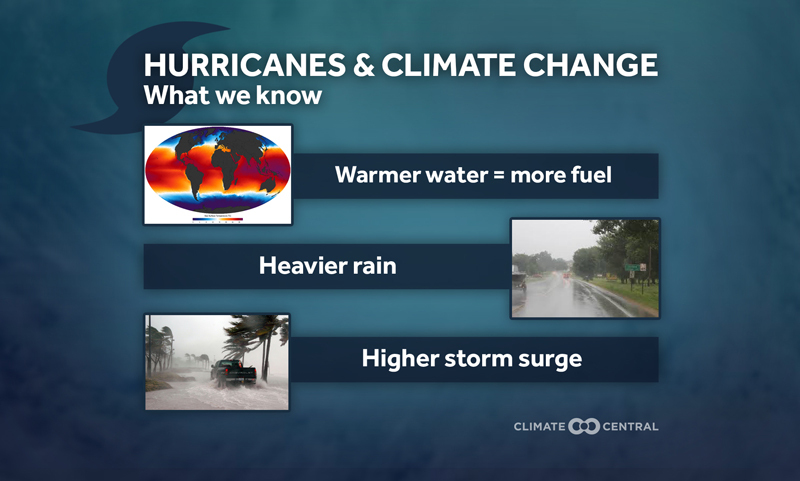 Major hurricanes (those above Category 3) have enough power to rapidly displace water in Biscayne Bay, generating localized storm surge maximums on the southern edge of metropolitan Miami. Hurricane Andrew tracked through this area as a Category 5 hurricane and pushed a 16.7-feet storm surge. 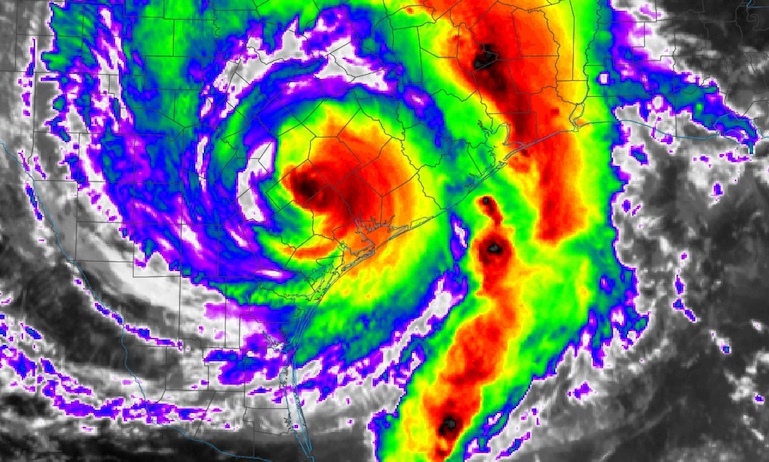 Fortunately, Andrew was a compact hurricane, enabling storm surge values to rapidly decrease away from the storm center. In the southern part of Miami (near northern Biscayne Bay), surge levels reached 11.81 feet and the surge was negligible from Fort Lauderdale northward. The Great Miami Hurricane of 1926 made landfall as a category-4 hurricane just south of Miami, and generated a 15-ft (3.57-m) storm tide in the southern portion of the city. At this point it appears that Irma has the potential to make landfall near or south of Miami, which would enhance storm surge levels. U-Surge has launched this archive of graphics, maps and multimedia resources to help raise public awareness of local storm surge risk as Hurricane Irma approaches. Raw datasets and statistical analysis for professional use are available through collaboration and consulting initiatives with U-Surge.